AppleInsider was able to verify the appearance of the 2012 redesign of the AirPort Express in the Home app after five attempts. However, like all of the rest of the accounts, when tapped, the device is not added as a HomeKit peripheral. The appearance of the device in the iOS 11.4 beta is the first time that it has appeared as a possible accessory. 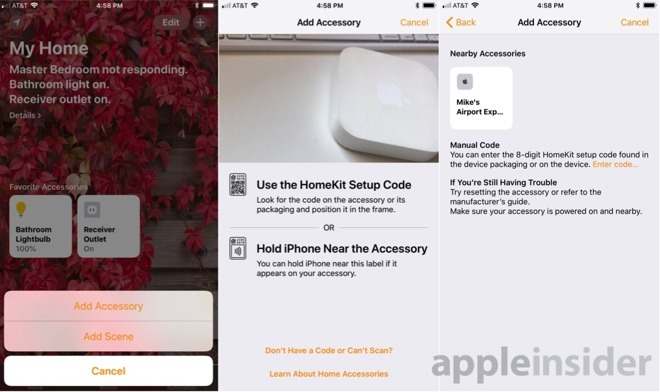 At present, the development status of AirPort hardware is somewhat up in the air, with reports confirmed by AppleInsider saying that the network hardware development division has been mostly dissolved, with some engineers relocated to other departments, and others keeping the device "as safe as possible, for as long as possible" in software. At present, the appearance of the old hardware appears to be nothing more than an aberration of the testing process —but the fact that it appears at all is a bit of a mystery. It is obviously related somehow to the device's AirPlay functionality, as the the AirPort Express has been a playback target for some time, since it was originally called AirTunes. Other AirPlay-compatible devices were tested, with none appearing in the Home application.